At one point in my life, I found I had become a bit of an accidental business owner as my side hustle actually turned profitable. And, although I was its only employee, and it had had its own EIN for just a few days, I was proud of the small business I had built. While it’s the C-corps that tend to make the most waves in the market, there are over 28.8 million small businesses throughout the US — the lot of which makes up a whopping 99.7% of all US businesses. And, though they’re all unique — like my little side-hustle-turned-business — they do all have one thing common: expenses. 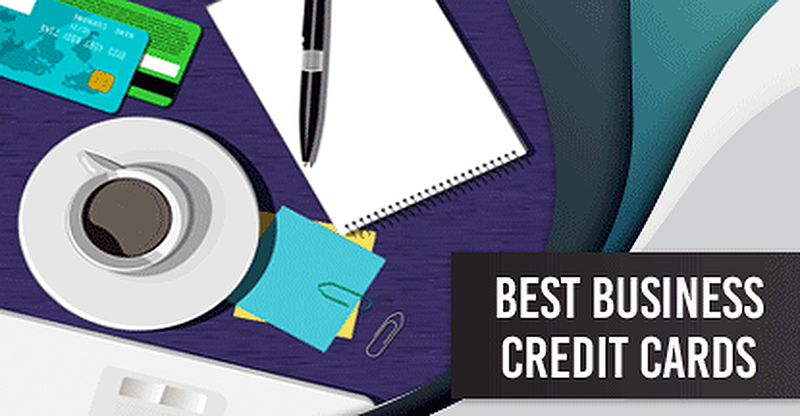 Whether big or small, your business likely requires buying a few things, and one of the best ways to finance your small business purchases is with a great business rewards credit card. Of course, with tens of millions of businesses, it’s fair to say there’s a lot of room for diverse offerings in the business credit card market — and the market certainly delivers. We’ve put together the best of each category to help you find the right card for your unique business. Given that every business will have its own unique array of expenses, it’s hard to choose one card that will work for every business owner. But, a few cards offer broad rewards categories or straightforward cash back that can be adapted to a range of needs and spending styles. This card offers several tiers of cash back bonus categories, including purchases made at office supply stores, telecom services, gas, and restaurant purchases. You’ll also pay no annual fee and receive a generous introductory APR deal on new purchases. This card offers triple points for a number of useful business categories such as shipping and select advertising purchases. Unlike its cash back sibling, this card has an annual fee, but it can be well worth it to business owners who can make the most of the Chase Ultimate Rewards® points it earns. If you’re looking for a no-muss, no-fuss cash back rewards credit card for your business spending, this could be your winner. It offers unlimited 2% cash back on every purchase, with no categories to keep track of or to activate. It also comes with a generous signup bonus and a waived annual fee for the first year. Although playing with rewards points can be fun for those cardholders with the time to spend maximizing them — time is often the last thing a busy business owner has in excess. Cash back rewards are a simple, easy-to-redeem alternative to rewards points that can be applied as a statement credit, often automatically. This unlimited cash back rewards card offers the same flat-rate rewards on every purchase, regardless of category. It also comes with a big signup bonus, no annual fee, and an introductory APR deal that can save you hundreds in interest fees over your first year of card membership. Every business is unique, but many share common expenses like office supplies and telecom services. If your spending falls into these popular categories, this card can help you earn big rewards on up to $25,000 in combined purchases per rewards tier each account anniversary year. Another straightforward cash back card, this option offers unlimited 1.5% cash back rewards with no category restrictions. It also has a competitive signup bonus, no annual fee, and a modest introductory deal that offers 0% APR on purchases. Cash back may be the simplest option, but rewards points are where the top redemption values tend to be found. With a little time and some smart transfers, savvy business owners can turn a pile of points into tons of free travel, merchandise, or gift cards to help boost their bottom lines. Not only does this card offer the very popular Chase Ultimate Rewards® points on every purchase, but you can earn points three times as fast on purchases in common business categories like travel, shipping, telecom services, and select advertising. The Blue Business Plus Credit Card from American Express is a solid all-around points card for businesses with expenses that don’t fit into bonus categories. While the Blue Business Plus card doesn’t have a points signup bonus, it does offer an introductory 0% APR deal and provides employee cards with no additional fees. The U.S. Bank Business Edge™ Select Rewards Card has broad bonus rewards categories that let you customize your rewards to save on the purchases you make most frequently. In addition to customizable bonus rewards, this card offers unlimited 1X point per dollar on all other purchases. It also comes with an attainable signup bonus and an intro-APR offer for new purchases. If you spend a lot of time on the road or in the air for your business, then you can likely appreciate the convenience and value of having flexible miles free from blackout dates or brand restrictions. These cards can help you earn rewards you can actually spend when and where you need to travel. With an unlimited 2X miles per dollar on every purchase, you won’t have to think about bonus categories or other limitations. Miles can be redeemed as a statement credit to cover a wide range of travel-related expenses, including hotels, airfare, and rental cars. This card can help you earn points in a hurry with its broad bonus categories. And they’re not just any points, they’re Chase Ultimate Rewards® points, some of the most flexible travel rewards on the market. Redeem them without restrictions in the Chase travel portal, or transfer to an eligible loyalty program for extra value. This card is a good choice for business owners with smaller budgets who still want to earn unlimited, flexible miles. Cardholders can earn 1.5X miles per dollar spent, pay no annual fee, receive an intro APR deal on new purchases, and pay no foreign transaction fees. Regardless of the size of your business, chances are good you spend some time at the local office supply store, be it for pallets of printer paper or just a few stacks of sticky notes. Many of the top business credit cards can help you save big on office supplies, making that latest trip to the store a little more palatable. Whether you spend a few bucks or thousands a year, 5% cash back on office supplies can make a big difference to your bottom line. This card’s 5% cash back category covers both office supplies and telecom services, up to $25,000 in combined purchases each account anniversary year. The U.S. Bank Business Edge™ Select Rewards Card offers users their choice of three broad bonus rewards categories. The Day-to-Day Expenses category includes office supplies, as well as shipping, advertising, and telecom and professional services. The Huntington Voice Business Credit Card℠ is a customizable cash back rewards card that allows cardholders to choose their own 4% cash back category each quarter from a list that includes Utilities & Office Supply Stores as a bonus rewards option. This card also charges no annual fee or foreign transaction fees. It also offers unlimited employee cards with the ability to set individual spend controls. Depending on the nature of your business, you may never need to step foot on a plane in the name of work. Of course, you may also need to step foot on nearly every plane as you travel here and there to build your business. The right business credit card can not only help you earn rewards on all that travel, but may also improve your experience with perks and benefits. The American Express Business Platinum Card® offers a hefty 5X points per dollar on flights and hotels booked through the Amex travel portal. It also has a range of travel-related perks, including an annual airline fee credit and access to hundreds of airport lounges. This card is a charge card with a variable credit limit, which means you won’t pay any interest fees on your purchases because you’ll need to pay them in full each billing cycle (unless you’re enrolled in the Pay Over Time feature). This card excels for business travel in two ways, the first of which is the triple points you earn for every dollar of eligible travel spend. The second reason to love this card? The Ultimate Rewards® points you earn can be redeemed for a broad range of travel expenses, as well as being transferable to a dozen hotel and airline loyalty programs. The U.S. Bank Business Edge™ Select Rewards Card offers users their choice of three broad bonus rewards categories. The Travel and Entertainment category includes purchases made with airlines, auto rental agencies, hotels, restaurants, and travel agencies. Although dining rewards may not be considered a traditional business perk, they can help you save on everything from client dinners to company parties. Because business is always better when it includes good food. The U.S. Bank Business Edge™ Select Rewards Card offers users their choice of three broad bonus rewards categories. The Travel and Entertainment category includes restaurant purchases, as well as airline tickets, hotel stays, rental cars, and travel agency purchases. The Huntington Voice Business Credit Card℠ is a customizable cash back rewards card that allows cardholders to choose their own 4% cash back category each quarter from a list that includes Restaurants as a bonus rewards option. This card charges no annual fee or foreign transaction fees. It also offers unlimited employee cards with the ability to set individual spend controls. Although is doesn’t extend the highest rewards rate of the bunch, this no annual fee business credit card offers 2% cash back on up to $25,000 in restaurant purchases each account anniversary year. It also provides bonus rewards in other useful business categories and comes with a hefty signup bonus. In the eyes of some modern consumers, a company without a website may as well not even exist. No matter your business model, internet and telephone services are crucial to success in today’s world — so why not save on them with credit card rewards? Regardless of whether it’s you and your smartphone or a team of telephone operators, this card can help you keep everything connected with 5% cash back on internet, cable, and phone services. You’ll also get 5% back on office supply purchases, with combined categories bonus rewards topping out after $25,000 in qualified purchases each account anniversary year. The U.S. Bank Business Edge™ Select Rewards Card offers users their choice of three broad bonus rewards categories. The Day-to-Day Expenses category includes telecom services and utilities, as well as shipping, advertising, office supplies, and professional services. The SimplyCash® Plus Business Credit Card from American Express offers 5% cash back on purchases made with wireless service providers, as well as 5% on office supplies and 3% cash back on a category of your choice. In addition to charging no annual fee, this card has no over-limit fee for going over your spending limit. New cardholders can also qualify for an intro-APR offer good for 0% interest on new purchases. For as long as there have been businesses, there have likely been advertisements for their wares and services — and the modern era is no exception, though our ads are now digital more often than not. But, no matter how you market your wares, you can likely save on the expense with the right business rewards credit card. This card’s advertising rewards are right in line with today’s business world, offering 3X Ultimate Rewards® points per dollar on advertising purchases made with social media sites and search engines. You’ll also earn triple points in other useful categories, on up to $150,000 in combined category purchases each account anniversary year. The U.S. Bank Business Edge™ Select Rewards Card offers users their choice of three broad bonus rewards categories. The Day-to-Day Expenses category includes advertising purchases, as well as shipping, utilities, office supplies, and telecom and professional services. The American Express Business Gold Rewards offers users a choice of bonus categories for triple points from a list that includes advertising in select media. Earn double points in the remaining categories. If you’re lucky enough to work from home, you may not value gas rewards on your business credit card very highly. But, if you’re stuck filling your tank every week to handle your business commute, there are likely few sweeter words than “gas rewards” — which these cards offer in spades. The U.S. Bank Business Edge™ Select Rewards Card offers users their choice of three broad bonus rewards categories. The Automotive category not only includes gas station purchases, but also rewards service expenses, tires, tolls, dealership purchase, car washes, and auto repairs. The Huntington Voice Business Credit Card℠ is a customizable cash back rewards card that allows cardholders to choose their own 4% cash back category each quarter from a list that includes Gas Stations as a bonus rewards option. This card may not have the highest rewards rate for gas station purchases available, but its 2% cash back also applies to another common road-warrior purchase type: restaurants. Plus, with no annual fee and an introductory 0% APR on purchases, that 2% cash back won’t be diluted by costly fees. While flexible rewards can be handy, few things can top co-branded credit cards for earning loyalty rewards and brand-specific perks. Whether you pick a favorite airline based on its service, its routes, or its mid-flight snack, chances are good you can get a business rewards credit card to help you make the most of it. The CitiBusiness® / AAdvantage® Platinum Select® World Mastercard® is ideal for American Airlines loyalists who want additional perks like a free check bag and preferred boarding. Cardholders who spend at least $30,000 a year on their CitiBusiness American Airlines card will receive a Companion Certificate good for one round-trip domestic economy trip, potentially worth hundreds. The Delta Reserve® for Business Credit Card from American Express is for Delta enthusiasts who want a premium experience that includes priority boarding and Delta Sky Club access. Cardholders will also receive a domestic First Class, Delta Comfort+®, or Main Cabin round-trip companion certificate each year upon renewal of their card. The Southwest Rapid Rewards® Premier Business Credit Card lets you earn loyalty points every time you swipe. You’ll also receive your first two checked bags free. While the card’s signup bonus may be worth adding it to your wallet, the 6,000 annual anniversary bonus helps it keep its worth after signup bonus is gone. While it’s a common joke that chain hotels tend to always look the same, a reliable and consistent experience can be worth far more to the regular business traveler than design originality. So, for business owners who have a favorite hotel chain, a co-branded hotel business rewards credit card can be worth its weight in gold (or, at least, in points and elite status). The Hilton Honors American Express Business Card offers a number of perks for cardholders, including Hilton Honors Gold status and free-night awards for meeting annual spending requirements. If you’re seeking Hilton Diamond status, simply spend $40,000 or more on your card in a single calendar year to enjoy a status upgrade through the end of the next calendar year. 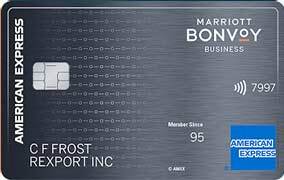 The Marriott Bonvoy Business American Express® Card is the business credit card for the newly rebranded Marriott Bonvoy rewards program. The card offers 6X Marriott Bonvoy points per dollar at participating properties, plus four points per dollar at U.S. restaurants and gas stations, and on wireless services purchased from U.S. providers. Other perks of the card include complimentary Silver Elite status with Marriott Bonvoy, a free annual award night after your account anniversary, and premium in-room wifi service. Plus, receive 15 elite night credits each year and pay no foreign transaction fees. 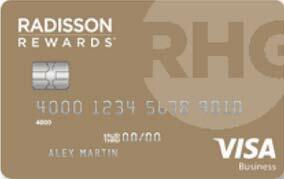 The Radisson Rewards Business Visa® Card is great for Radisson hotel fans who want to earn free stays quickly. In addition to bonus rewards for Radisson purchases, you’ll receive free Gold elite status. In addition to a large signup bonus of up to 85,000 points when you hit the tiered spending requirement, this card awards you 40,000 bonus points each year you renew and one free night for every year you spend $10,000 or more on your card. As is so often the case in consumerism, the biggest advertising budget usually gets the lion’s share of the market. But big banks aren’t the only source of great small business credit cards. Your local credit union can not only provide competitive rewards, but often offers better rates and fees than your typical big-bank credit card issuer. The RBFCU Business Select Mastercard® is an easy way to earn rewards on every purchase without needing to worry about keeping track of bonus categories. Plus, the card is nearly fee-free, with no annual fee, balance transfer fee, or cash advance fee. Since it’s a credit union, you’ll need to become a Randolph-Brooks Federal Credit Union member and open a primary savings account with a minimum deposit of $1 to qualify for an RBFCU credit card. The ICCU Business Premier Rewards Visa® offers 2X points per dollar on every purchase, as well as lots of opportunities to earn bonus rewards with your card, all with no annual fee, no balance transfer fee, and no fees for cash advances. Credit unions require you to be a member to obtain their cards, so you’ll need to join the Idaho Central Credit Union and open a checking or savings account to apply for the card. The Visions FCU Visa® Business Rewards Plus Card gives you a choice of triple-points bonus rewards categories, plus 1.5X points per dollar on all other purchases. There are also no foreign transaction fees and the annual fee is waived for the first year. You’ll need to join Visions Federal Credit Union to become eligible to apply for a credit card. You’ll need at least $25 to start your membership. While it takes just six months of history to get a consumer credit score, it can take years to build a healthy business credit score. Until your business can stand on its own, your personal credit history will come into play, which can be a problem if you have less-than-stellar credit. Thankfully, a few business credit cards are available that have flexible credit requirements, including both unsecured and secured options. This is one of the few unsecured business credit cards on the market that will accept applicants with fair credit. As a card for building credit, the bells and whistles are limited, though users do earn 1% cash back rewards, and there’s no annual fee. The Wells Fargo Business Secured Credit Card will require a deposit to secure your credit line, but it can be a good way to establish and start building that all-important business credit. You’ll even earn cash back as you do it, with 1.5% cash back on every purchase. The BBVA Secured Visa® Business Credit Card is also secured, so it will require at least a $500 deposit to open, and your available credit will be equal to 90% of your deposit amount. Even better, you’ll earn rewards on every qualifying purchase. A common question, especially from small business owners and sole proprietors, is why use a business credit card in the first place? A good way to understand the answer to this question is to consider the alternatives. For example, a common alternative to a business credit card is to use a bank line of credit. But, while credit lines are often similar in nature to a credit card, there’s one key difference: rewards. Your typical line of credit won’t offer you purchase rewards, whereas a rewards credit card can potentially save your business hundreds of dollars a year. Alternatively, without a business credit card, you may be tempted to put your business expenses on your personal credit cards. While this can be a viable method if your business expenses are small, it becomes less tenable as your expenses increase. To start, charging big business expenses on your personal cards can cause your utilization rates to increase as you use more and more of your available credit. Since utilization can be worth up to 30% of your FICO score, a high utilization rate can cause your score to significantly drop. The general rule of thumb is to keep your utilization rate below 30% (though lower is always better). The ratio of your credit card balance to your total available credit is called your utilization ratio, and it can be worth up to 30% of your personal FICO credit score. But, perhaps the most important reason not to use your personal cards for business expenses are the bookkeeping ramifications. Tracking and reconciling your business expenses can become a big hassle if your personal and business expenses are muddled together on the same credit card statements. Having a separate small business credit card can allow you to keep your personal utilization levels low, as well as provide a simple and easy way to track your business expenses. This can not only make budgeting easier, but may make tax time simpler, as well. Additionally, consumer expenses usually fall into very different categories than common business expenses. This means you’ll likely earn more in rewards by using a business rewards credit card that matches your company’s spending habits than you would using your personal credit cards. Finally, business credit cards can be a good way to establish and help build your business’s credit score. Your business has its own credit profile separate from your consumer credit profile, and the stronger your business’s credit score, the easier (and cheaper) it will be to get business credit in the future. In general, business credit cards operate the same way as consumer credit cards. For most cards, you can fill out a simple online application and receive an answer in minutes. If approved, your card is mailed to you in about a week, and you can make purchases as soon as you activate the card. The biggest difference between business and consumer credit cards is that you need to own a business to obtain a business credit card. However, the definition of business owners is fairly broad, and it can include everyone from sole-proprietor freelancers to 20-employee small business CEOs to Fortune 500 company heads. 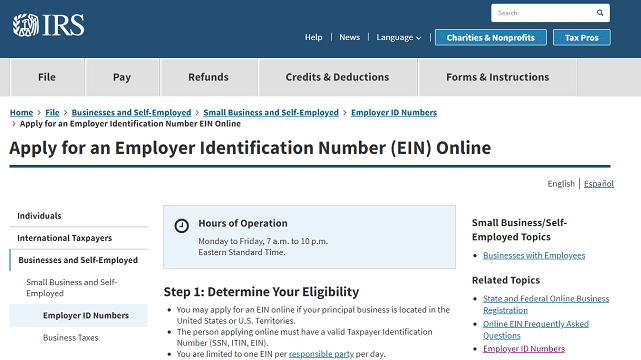 You can obtain a business EIN (Employer Identification Number) online through the IRS website. Depending on the nature of your business, you’ll use your company’s EIN (Employer Identification Number) and/or your own Social Security number to apply. It’s highly encouraged that you obtain an EIN for your business, even if you are a sole proprietorship, as this is necessary to establish a business credit profile. While the actual size of your business doesn’t matter, being truthful on your application does matter. For instance, don’t feel compelled to “fluff” your revenue just because you operate a small business on the side or are just starting out. It’s better to report your actual income than it is to be caught lying on a financial application. Given that there are as many combinations of business expenses as there are businesses themselves, selecting the best business rewards credit card will begin with analyzing your company’s specific needs. An easy way to narrow down best rewards for your business is to start with your largest expense and work down the list from there. For example, if your company spends the most money each year on office supplies, then start with a short list of business cards that offer rewards for office supplies. If your next-largest expense is travel, then you know a card that offers bonus rewards for office supplies and travel will be a good fit and offer a lot of potential value. Make sure, regardless of the specific rewards program you choose, that it’s one you’ll actually use. Rewards that are too difficult or time-consuming to redeem will sit fallow or even expire — which isn’t valuable to anyone. 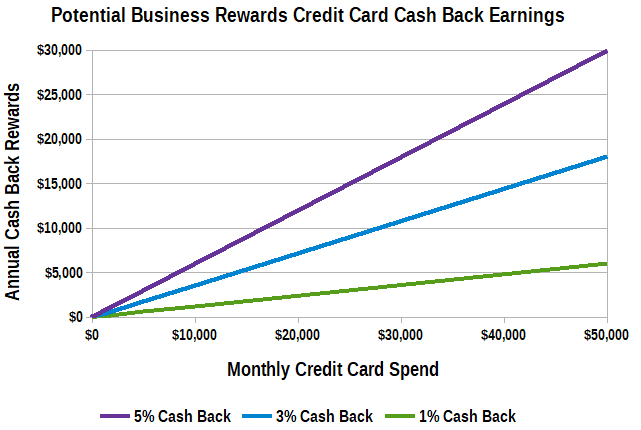 In some cases, of course, it may not even be the rewards themselves that save you the most money; if you know you’ll need a few months to pay off an upcoming business purchase, for instance, then a business credit card with a 0% introductory APR offer for new purchases can be worth more than the purchase rewards themselves. Secondary characteristics can also be very important when choosing the right card. Whether a card charges an annual fee, for instance, can mean a difference of hundreds of dollars a year, depending on the card. And if you travel or make overseas purchases frequently, then you’ll likely place a premium on a card without foreign transaction fees. Most credit cards also come with extra perks and benefits from the credit card issuer or network. These can include useful travel perks, such as rental car insurance, as well as valuable purchase protections, like extended warranty protection. These benefits can be quite lucrative if you can make full use of them. Given that most business owners are busy, you know, running their businesses, there’s not a lot of extra time to dedicate to worrying about whether they’re maximizing their credit card rewards. Thankfully, it doesn’t take much to make the most of your business cards. Indeed, so long as you choose a business rewards credit card that matches your company’s expenses, you’ll likely see great value simply from using your card to make everyday business purchases. That said, there are things you can do to ensure you’re getting the full value without spending a lot of time or energy on the process. An easy way to maximize the value of a new business rewards credit card is through the signup bonus. Most rewards cards will come with a one-time bonus of cash back or rewards points that can be earned by meeting the set spending requirement within a few months of account opening. Most business rewards credit cards will offer some type of signup bonus that can be obtained by meeting the minimum spending requirements. While you should never spend more than you would otherwise simply to reach a signup bonus, keeping an eye on your eligible spend can help ensure you don’t miss out on a bonus thanks to a technicality. For instance, only net purchases count toward the spending requirement, so be cognizant of any returns you make. You should also be sure to pay off your credit card in full every month to avoid interest fees. The vast majority of credit cards offer at least a 21-day grace period, so you won’t be charged interest on purchases so long as your total balance is paid before your due date. Another good way to ensure you’re always getting the best value out of your business credit cards is to do an annual inventory of your cards. If some of your business credit cards are no longer worth their annual fees, it may be time to say goodbye in favor of a card that better suits your current needs. That’s not to say you should eliminate all cards with annual fees; some fees can be worth the cost if you get a lot of value from the rewards and/or perks and benefits. However, if you haven’t used a card in the last year or don’t value its perks as highly as you once did, it may not make sense to keep paying the card’s annual fee. Although most people likely picture the boardrooms of the 0.3% when they think of a business, it’s really the small businesses that make up 99.7% of US businesses — and it’s the small businesses that keep our lives on track every day. Whether you have an established company with a team of employees, or a startup side hustle run by a party of one, being a business owner requires time, energy, dedication — and money. Because every business comes with expenses. There are myriad reasons to use a good business credit card for your everyday business expenses, not the least of the which is the simplification of tracking your business expenses. But business credit cards can also provide significant value through purchase rewards and card membership perks.